Default: The default WordPress sender name is used. You can change this text to anything meaningful for your forum. This will identify the sender’s name in the email sent. Note: If this textbox is empty, the default value will be used. Default: The default WordPress sender mail is used. You can change this email address to anything meaningful for your forum. This will be the sender’s email address when an email is sent. Note: If you have a lot of activity in your forum, we recommend you specify no-reply@domain.com so that you do not get flooded. A comma-separated list of mail-addresses which can receive administrative notifications (new reports, unapproved topics, and more). This setting only allows user who are logged in to subscribe to forums and/or topics. When this setting is disabled, nobody can subscribe to anything but the site owner can still get notified about new topics if the corresponding option is enabled. Turning this ON (by ticking the box) will result in emails going to the site owner, as identified in the WordPress Settings -> General -> Email address. When enabled, users can reference each other inside posts. 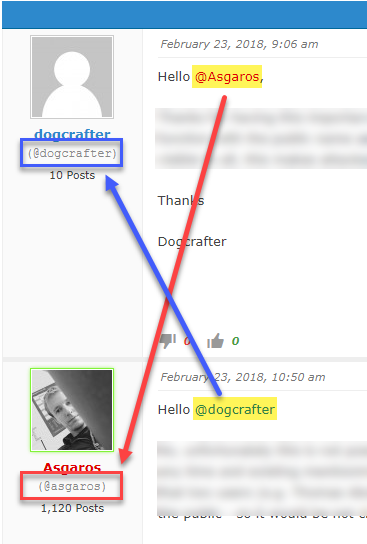 This allows you to mention users inside your posts by typing @[username]. Note: You must use the user name which is shown below the users display name. Mentioned users automatically get notified via e-mail and their name links to their profile (if you have profiles enabled in your settings).